Disclosure: Subway provided the prize for this giveaway and also gave me my own Subway gift card for sharing this promotion. Please read our full disclosure policy for more information. Here I am enjoying the new Smokehouse BBQ Chicken sandwich at Subway. Don’t I look smart and saucy? I’ve been trying to move more and eat better, but it’s also an incredibly busy time of year for us with school activities and such. So I’m grateful that Subway has added a new sandwich to the menu for the month of May – the Smokehouse BBQ Chicken Sandwich. The new sandwich is part of Subway’s Fresh Fit menu – which means that with just 6g of fat, it’s a good choice for a meal on the go. Thanks to the kind folks at Subway, I recently tried the Smokehouse BBQ Chicken sandwich and I was impressed. It’s a filling mix of sweet and tangy tender chicken. Piled high with all my favorite veggies and a little bit of extra BBQ sauce, this sandwich is a new favorite of mine. 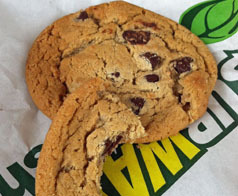 And since I saved all those calories on the sandwich, I can indulge in Subway’s amazing cookies. Now if only those were on the Fresh Fit Menu! The Smokehouse BBQ Chicken sandwich is only available at Subway through May so don’t miss your chance to get it. Grab the footlong for just $6 and you’ve got a tasty and healthy lunch for you and a friend. And now on to the best part. Subway wants to treat one of you! One lucky Northern Cheapskate reader will win a $25 Subway gift card! This giveaway is open to all US residents ages 18 and older and will end at 9 p.m. CST on Thursday, May 9, 2013. One entry per person. No purchase is required. You may receive one bonus entry (for a maximum of two entries) when you subscribe to Northern Cheapskate by e-mail. The information I collect in this giveaway will only be used to verify your eligibility and to contact you if you win. I had that same sandwich today for lunch. I liked it!